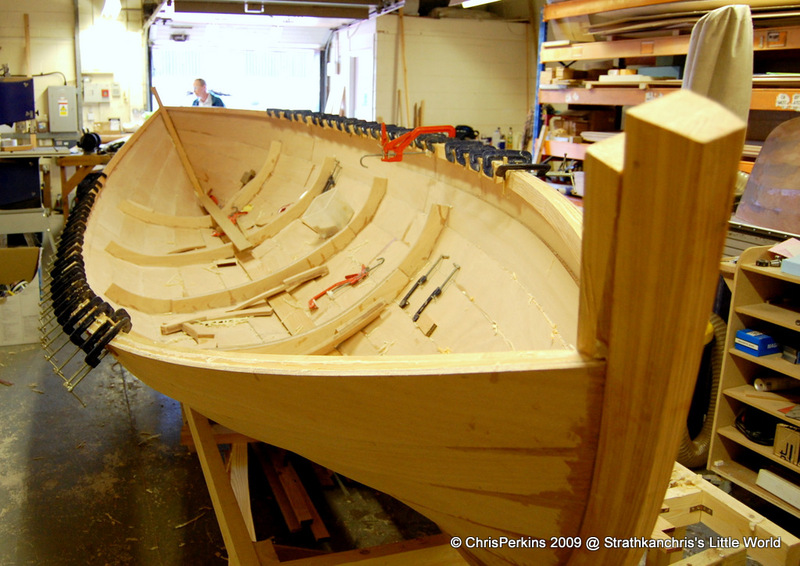 The first Iain Oughtred-designed St Ayles skiff currently being built in Alec Jordan’s workshop continues to make steady progress as the construction team worker on her interior joinery. 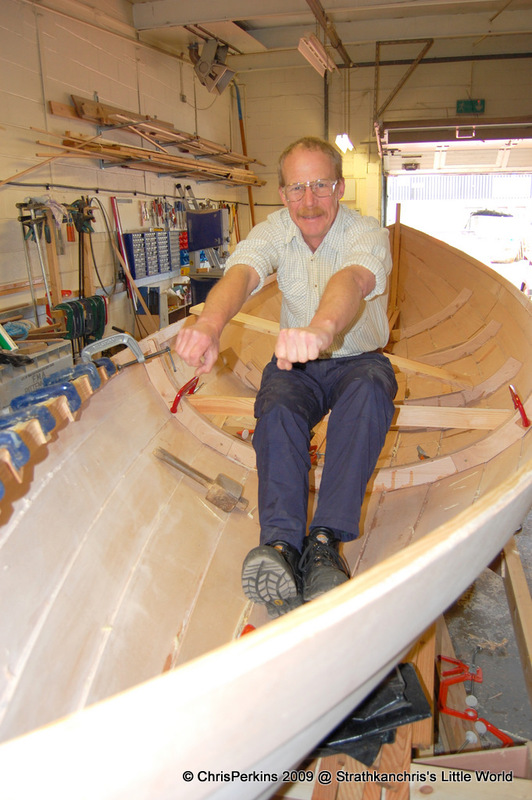 For more on the St Ayles skiff and the Scottish Coastal Rowing Project, click here. Not much obvious progress over the last week, attached snaps show the state of play as at last Friday. I think the week has demonstrated the obvious: kitting a clinker ply hull only saves time in skinning the hull, the internal fitting out with all it’s joinery challenges still takes as long as it ever. Some deep thinking is going on during the fitting out to help make this part of the build as easy as possible for novice builders. We have already partly moved away from Iain’s glorious sweeping taper of the inwale, planing that down on all three laminations has proved very time consuming; the twisted grain in larch hasn’t helped as deep cuts tend to tear out, so fine cuts and very keen plane irons are the order of the day. 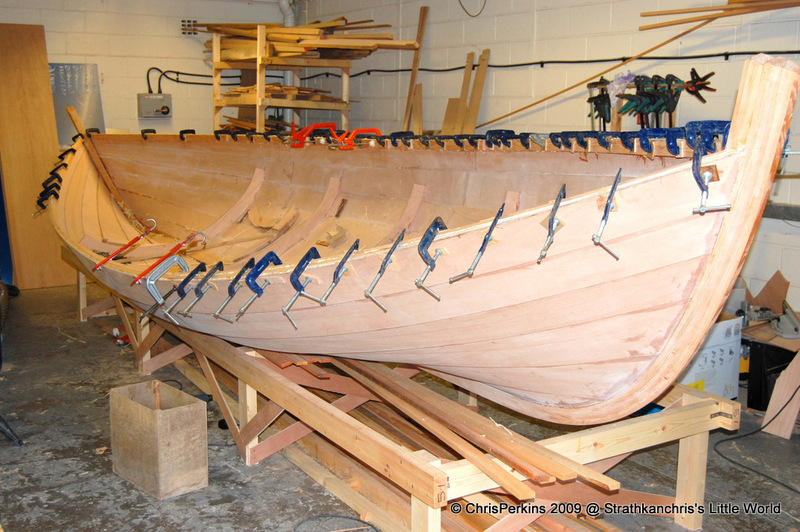 Our modification does recognise tradition as study of a traditionally built Fair Isle skiff shows – though I just wish I had taken far more snaps of Aluna Ivy at the Portsoy Festival this year! If only I had known what I would be getting involved with! The trial of seating positions by Alec was very useful. The cox is going to have to be a pretty short lightweight as there is not a great deal of room in the stern, but we are now comfortable that the spacing of the thwarts is going to work well. Thanks Chris! I look forward to hearing more about the project next week. Don’t miss something good. Sign up below to receive the weekly intheboatshed email newsletter.